Unique features, luxury inclusions and ample space are hallmarks of this impressive home in a premium location near the Shepparton Golf Club precinct. The substantial two-storey home offers scope for a large family to move in and make it their own, with a ground-floor fifth bedroom/study conveniently located for those who require a home office. 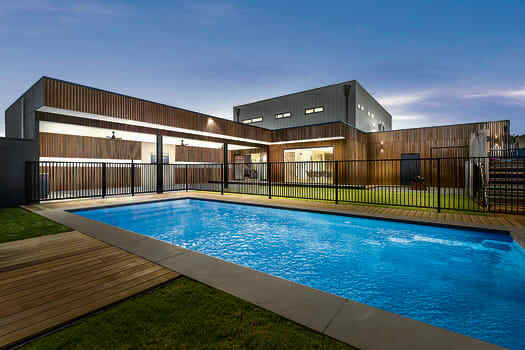 A striking grey-toned façade has locally-sourced spotted gum timber accents, undercover deck and over-sized front door, giving a hint of the grandeur and style beyond. The wide entry hall has the fifth bedroom/study opening off one side, and a spacious living area, with blackout blinds, which would make a perfect theatre room, on the other. Engineered oak flooring flows through the home to the open-plan family area incorporating the kitchen, dining space and large lounge, complete with customised cabinetry and black accents. 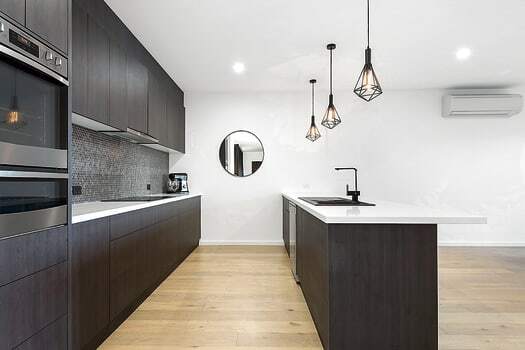 Quality appliances, Caesarstone benchtops and a butler’s pantry will make meal preparation a breeze; the large laundry has plenty of cupboards, and a dedicated mud-room for shoes, coats and schoolbags opens onto the garage, and assists with maintaining an orderly home. Double-glazed windows and fixed panel glass offer views to the sparkling in-ground pool and access to the enormous undercover entertaining area, complete with ceiling fans, full outdoor kitchen and Bluetooth speakers for playing music. The scope for relaxed family living continues upstairs with four bedrooms, each with a split-system airconditioning unit, a family bathroom, separate toilet and an open space for sharing time together. 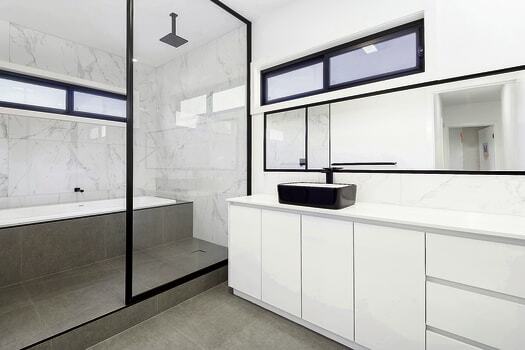 Black, grey and white tones create a stylish colour scheme in the family bathroom and ensuite and there is excellent storage with a walk-in robe to the master bedroom and built-in robes to the other bedrooms. Careful consideration has gone into every aspect of planning this stunning home, even down to a security system with intercom and vision screens. A five-car garage incorporates a bathroom, for use when entertaining outside, and two large barn doors allow the garage to open onto the backyard area to double the undercover space when required.